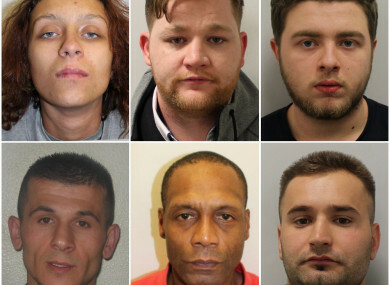 Anna Silva, Anthony Maughan, Bradley Allingham, Anton Krasnioi, Anthony Philips and Bledar Zefi - all wanted by Met Police. METROPOLITAN POLICE HAVE launched a new awareness campaign seeking the public’s help in tracing 38 wanted individuals and will be displaying their faces on vans around London this week. Police said the individuals are wanted for crimes that include violent moped-enabled crimes, street robberies, burglary and violation of release conditions. Two vans will be driven around London to encourage people to come forward with information that could help locate the people in the photographs. A public appeal will also feature on BBC’S Crimewatch Roadshow today and operational teams will be working to respond to any live intelligence received. We are relentlessly pursuing violent offenders and bringing them to justice, but we need the help of the public as well. Somebody somewhere knows something about these criminals and I urge people to pass any information to us as soon as possible. One phone call could potentially solve or even prevent a crime from happening. He also urged the people in the photographs to hand themselves into their local police station. “Knocking on our door is infinitely better than us knocking on yours,” he said. Full details of all 38 of the wanted individuals can be found here. Email “Police to display photos of wanted people on vans around London”. Feedback on “Police to display photos of wanted people on vans around London”.